If you want your skin to be as youthful and radiant as possible, you have to give it the tools it needs to repair itself. 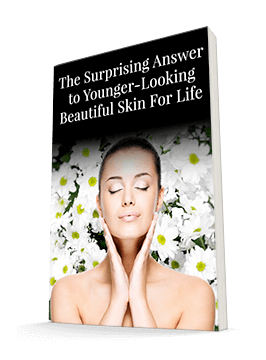 All the serums and creams in the world can't fully mask the effects of aging on your skin. As your skin cells age, they lose elasticity and vibrancy. You'll start to see sagging skin, wrinkles, and age spots. Unless, that is, you can turn back the clock for your cells. It turns out, you can. You've probably heard about stem cells. Stem cells are called "master cells" because they regenerate damaged tissue and help the body repair itself. Plus, they also have the ability to develop into many different types of cells. When a stem cell divides, it can either remain a stem cell or become another type of cell with a more specialized function – like a skin cell. This means you can harness the power of stem cells to reset your skin's aging and encourage it to look like younger skin. You may think stem cells are controversial. And they can be. But not plant stem cells. They're just as effective for skincare as human stem cells. So since you don't have to worry about any ethical ramifications of using plant stem cells, let's discuss their benefits. What's great about stem cells is that they can renew themselves. This is part of why our skin looks young and healthy for as long as it does. The natural stem cells in our skin renew themselves for years. But they do wear out eventually. In fact, by the time we reach our 20s, these cells are starting to age. That may sound young, but 20 years is a long time. Fortunately, you can start replenishing your own skin cells with plant stem cells, and you'll maintain your youthful appearance long past your 20s. Since prevention is in the long run a lot easier than a cure, you can begin applying products made with stem cells long before those first lines and wrinkles ever appear. If your skin is already showing signs of aging, stem cells are the reinforcements your skin cells need. They can actually decrease the depth of wrinkles and improve skin's texture. In fact, in one study of the stem cell extract that's found in Système 41, PhytoCellTec®, participants noticed big changes. 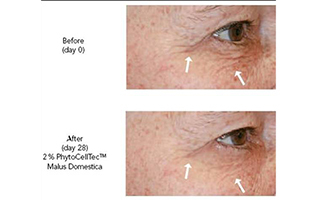 In the study, 20 volunteers applied the PhytoCellTec® to their faces twice a day. After 28 days, every single one of the volunteers – that's 100% – noticed as much as a 15% reduction in the appearance of crow's feet around their eyes. Their skin felt smoother and firmer, too. Products featuring plant stem cells are just appearing on the market. The first product cost over $1,000 for less than an ounce. Another European brand cost $500. According to Vogue, First Lady Michelle Obama uses a similar stem-cell product to keep her skin young, fresh and glowing – for a mere $300 a jar. But thanks to Système 41's stem cell technology, you can enjoy the same young-again skin for a fraction of the cost. Plant stem cells are an amazing way to keep your skin looking young, healthy, and vibrant. They tell your skin what to do to stay elastic and firm rather than sagging and wrinkly. You really can turn back the clock for your skin – Système 41 makes it easy. Barthel R, Aberdam D. Epidermal stem cells. J Eur Acad Dermatol Venereol. 2005 Jul;19(4):405-13.